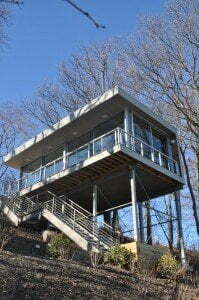 The design concept was to renovate an existing thirty year old beach house perched over Lake Michigan. We designed, fabricated and installed a wall system that includes oversized patio doors glass and screens that can be easily opened or closed as conditions permit. The result is a beach house that can be used year round. The glass wall system is fully insulated for the coldest winter day. When desired, the entire patio door system can be easily unlocked and rolled to create a completely open environment. Call us and we’ll be glad to show you how we can help you with your architectural glass needs that you or your client will enjoy for decades to come. The Lake Michigan Beach House posed a series of interesting goals challenges for our project management team. Our primary goals were to create the maximum viewing glass and highest glass performance while ensuring dependable ease of operation. We accomplished this by designing and specifying the highest quality Arcadia patio doors. Each glass panel measures over five feet wide and almost ten feet tall and includes insulated glass that is 1 and 1/8 inches thick. The panels weigh over four hundred pounds each yet can be opened or closed with one hand. All of this needed to be transported across a lengthy footpath and installed over a ravine. While our team of installers enjoyed the views, Lake Michigan famously delivered stiff early winter winds that added to our challenges! As always, our team safely and with flawless execution delivered and installed a beautiful product. 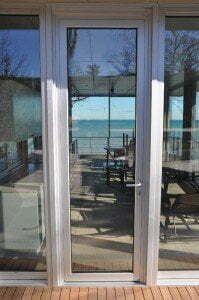 Each patio door opens and closes with precision and the views of Lake Michigan from this vantage point are awesome. When we visited, Lake Michigan was in full fury and yet the beach house is now a very comfortable and warm perch from which to enjoy everything nature throws at it. If you ever have heard the wind whistling through a patio door and want a better for yourself or your, contact us today!